As predicted by the weekend box-office haul of Taken 2 and everyone familiar with integers, there will almost definitely be a Taken 3, as all but confirmed by screenwriter Robert Mark Kamen. "We didn't start talking about [it] until we saw the numbers, but then we said, 'Oh, okay. I think we should do a third one,'" Kamen said of the burst of inspiration that fueled the creative decision to extend the story of Liam Neeson wrestling the Eastern Hemisphere, as so many a story has been sparked to life by the grace of the Muses. "And Fox wants us to do a third one," the storyteller added. Of course, Kamen admits there may be some limitations to how the formula can be further stretched, likely disappointing anyone who hoped to see Neeson going after an ever-branching family tree of kidnapped third cousins, or adopting children only to see them immediately snatched away. "We've taken everyone we can take," Kamen says. "It's going to go in another direction." 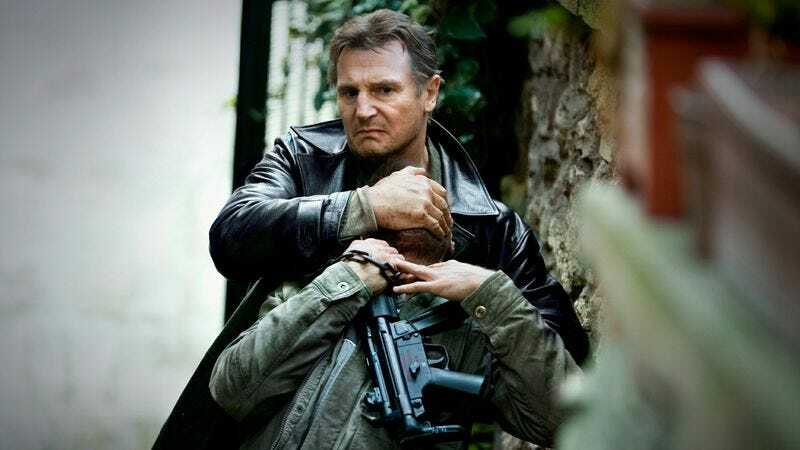 So look for Taken 3, in which Liam Neeson runs through the streets of Pakistan, giving away all his relatives.